What is the Spirit Academy? KGDC is excited to announce the new SPIRIT ACADEMY! At the Spirit Academy, we aim to build complete athletes and teams. This in mind, we focus on training teams to their fullest potential and provide a character building and meaningful experience for all our athletes, in hopes the lessons they learn with us provide the optimal steps to carry them to college and beyond. Looking for something for your team? We offer team facility rental, team open gyms, and team camps customized to fit your team's needs. The Spirit Academy aims to train and provide resources not just for individual athletes, but for recreational and school teams and coaches. This is the reason we offer specialized classes, for teams only, as an additional resource to area programs. Check out our gym rental, private team sessions, and camps or clinics. Are you planning on trying out for your Middle School or High School Cheerleading team? We can help! KGDC’s Spirit Academy staff will be hosting three special 3-Hour clinics to help prepare your athlete for all aspects of tryouts. 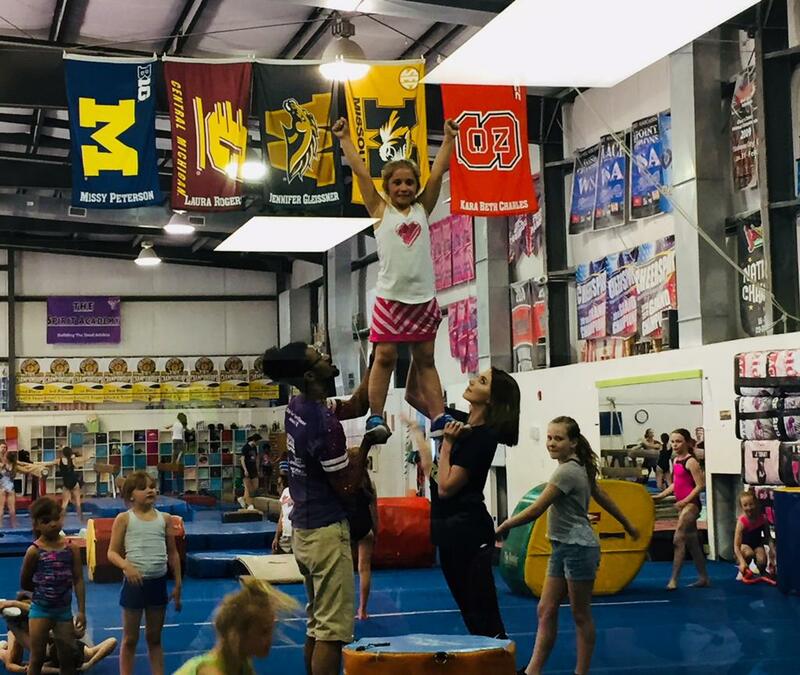 These clinics are designed to help aspiring cheerleaders or current cheerleaders perfect their Dancing, Jumps, Tumbling, Chants, & Stunt Technique! Sign up is required via the parent portal on our website at www.kgdcgymandcheer.com. If you are new to KGDC you will need to create an account first. Once you are logged in, select the special events tab to the left of the screen and select tryout clinic. Payment will be due upon sign up. A minimum of 10 children will be needed in order to run each clinic. If you have any questions please contact Michael Kearns at kgdcallstars@gmail.com. Spring Break is on the horizon, what better time to get out of the house and TUMBLE?? From 3:00 PM to 5:00 PM on Monday, March 11th AND Wednesday, March 13th, our fabulous tumbling instructors are holding 2 Hours of Intensive Tumbling instruction. Whether you’re just learning how to hold a hand stand or putting the finishing polish on a fun twisting skill, you’re in for a warm welcome and beneficial training. Clinic participants will be taken through a thorough warm up and stretch before we get into each athletes’ mastered skills. Instructors will set up stations which include mats, floor exercise, trampoline drills, foam pit & resin pit to help expand on those mastered skills and lead into the second half of the clinic. The second half will start challenging participants to break through into new territory with hands-on instruction and new skill stations.